SweetGeorgia Yarns are dyed in Vancouver, Canada. Born 10 years ago, this brand has a solid reputation of offering beautiful fibers in gorgeous hues. Learn more about the process and the people behind this Canadian staple in this interview with Felicia Lo, founder of this beautiful brand. Tell us about yourself, Felicia. I live in the beautiful Pacific Northwest with my husband, 2 ½ year old son, and soon-to-arrive baby girl. Tell me about how you came to be a lover of all things fiber? I taught myself to knit when I was in grade school and knit my first sweater during the summer before I started high school. In addition to knitting and dyeing, I spin, weave, crochet, sew, and quilt. I do it all! Ok, maybe not rug hooking, but that’s just because I haven’t found a teacher yet. I learned to knit and crochet when I was still in grade school and then later switched to sewing my own clothes in high school. After university, I picked up knitting again, along with spinning and dyeing. And when I was pregnant with my son nearly 3 years ago, I started quilting. I love yarn and fabric crafts for the sheer joy of making something from nothing, but also because there is a unique opportunity to play with and experiment with colour! How did all of that lead you into starting a business dyeing yarn? It was purely accidental, really. I had been obsessed with knitting since I was a kid but never thought I would end up working in the yarn industry. It was later when I was blogging about knitting, spinning, and dyeing that readers started to suggest that they would be interested in buying what I was making. Prior to that, it had never crossed my mind. What are the values under which SweetGeorgia Yarns exists? Besides our very core beliefs of “do what you love” and “do everything with excellence” we have a strong culture of family and freedom. I’ve always wanted to build a workplace that is family-friendly and provides the flexibility needed for new parents. Because I really wanted to be able to combine a family and work, I really want others to feel the same support to do so. We often have kids at the studio while we work and we offer flexible working hours and arrangements for parents. We also have a team of highly creative artisans who practice their art in different mediums. We very much want to build a supportive environment for creative expression alongside our production work. Thankfully, I’m able to have a family AND SweetGeorgia because we have an incredibly awesome team of people. Currently, we are about 16 strong with a production team in Vancouver, our knitwear design director in Colorado, and our marketing and sales gal in the UK. My greatest learning experience was probably letting others help me in my work. That’s been the single biggest game changer. What inspires your stunning colourways? Our colourways are deeply inspired by my past memories and stories of my experiences. In some cases, those are related to this gorgeous Pacific Northwest environment that we live in or perhaps tastes or music that have become the backdrop to my life so far. For example, one colourway that we are bringing into our main collection this Spring is called “Night Owl” and it’s one that I created when my son was just 3 months old and up all night! It is roughly based on a complementary colour scheme of dark purple and navy with light yellow, but in proportions that make it seem like a soft golden moon amid a deep midnight sky. The colours have quite a high contrast, so overall it feels tender but strong… quiet but brutal. 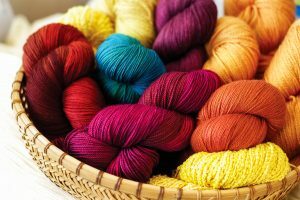 How do you choose the yarns you dye? I have always focused on yarn bases that are classic in appearance, smoothly spun, and always plied. Classic yarns are easy to work with and create a beautiful canvas for the colours that we dye. And plied yarns are essential for ensuring strength and longevity in hand-knitted garments. Knitting is such an investment of time, resources, and heart that it is so important that the things that are made from our yarn really last and can be trusted to wear well. We work with about a dozen yarn bases that range from fine cobweb laceweight to thick, chunky weight in a variety of fibres including merino, superwash merino, bluefaced leicester wool, silk, and cashmere. 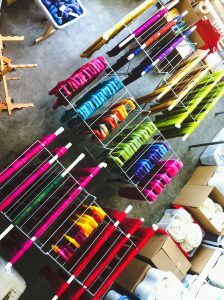 We also dye a number of different spinning fibres for those who want to spin their own yarns. What are your own favorite yarns, and how do your favorites compare to SweetGeorgia Yarns bestsellers? Silk-blended yarns are my favourite! And in terms of colour, I love them all… from the bright and vibrant to the seductive neutrals. Interestingly, our number one best-selling colour is beige (Tumbled Stone). Where do you hope your company goes next? To the moon and back. Seriously. There’s a whole world of things I want to do with SweetGeorgia that we haven’t even touched yet. Stay in touch with SweetGeorgia Yarns on Facebook and their Website.